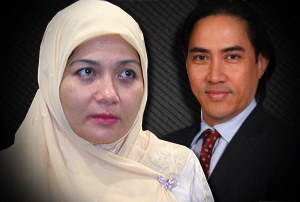 The highest court in the Shariah judicial system today heard the heavily contentious multi-million Ringgit divorce demands by Shahnaz Abdul Majid against her former husband Sarawak business entrepreneur Datuk Seri Mahmud Abu Bekir Taib. Three appeals were filed for adjudication at the Kuala Lumpur Shariah Appeals Court. The appeals were being heard before Chief Shariah High Court Judge of Wilayah Persekutuan Datuk Mahammad bin Ibrahim; Chief Shariah High Court Judge of Perak Datuk Muhamad Asri bin Abdullah and Shariah High Court Appeals Judge Datuk Yusof bin Musa. Mahmud has also applied to rectify the intitulement of the said appeal to correct the title of his application from ‘Selangor’ to ‘Wilayah Persekutuan’ which will be heard on 9 July 2015.